David Finko was born in Leningrad (now St.Petersburg ), Russia (then the Soviet Union ) on May 15, 1936, to a family of a noted mathematician and submarine designer. In June of 1941, he was with his mother and baby sister at his maternal grandparents’ home in the small town of Ushachy in Whiterussia when the German Invasion into the Soviet Union (during WWII ) took place. The town was taken and the grandparents were executed by the German Army, but David with his mother and baby sister were able to escape from the Germans. They took and changed several freight trains running from the Germans and traveling for a month on small amounts of food and water. David was five years old, and he witnessed the destruction of those trains by German bombers and saw bloody human remains. Those experiences strongly influenced his future music. He attended the elementary school in the city of Gorkii on Volga River until the end of the WWII. In the summer of 1945, he returned to Leningrad where he graduated from middle school in 1950, and from High School in 1953. David also studied piano with several teachers in Leningrad and, studying in the evenings, graduated from the Rimsky-Korsakov School of Performing Arts in 1958. Following in the footsteps of his father, David was persuaded by family and friends to become a naval architect, and consequently studied Naval Architecture and specifically Submarine Design at the Leningrad Institute of Naval Architecture for six years, graduating in June of 1959. From 1957, David was also apprenticed at the Submarine Design Bureau in Leningrad where he wrote and defended his thesis in the summer of 1959; later that year, he was appointed as Submarine Design Engineer at the same Bureau. In the summer of 1958, he was a crew member on two Arctic submarine patrols. But David could not forget and drop music. While working at the submarine design bureau, he studied Composition at the Leningrad Conservatory of Music for five years. His teachers included O.A.Evlakhov, V.N.Salmanov and B.A.Arapov, who were all well-established Leningrad composers and professors of composition. In 1965, David Finko’s Sonata for Piano #1 was awarded the First Prize in the Conservatory New Compositions Contest. The same year, David abandoned his engineering career and became full time composer. As a member of the Union of Soviet Composers, David Finko has written many large scale works on commission from the Ministry of Culture of Russia and from noted performers. Also David held a position of an editor at the State Music Publisher “Soviet Composer” in Leningrad until 1979. For religious and political reasons, David Finko left the Soviet Union and emigrated to the USA in December of 1979, and became a US citizen in 1986. He has taught at Yale University, the Universities of Pennsylvania and Texas, Swarthmore, Combs and Gratz Colleges, among other music schools. He has received awards from the Fromm and Fels Foundations, Pennsylvania Council on the Arts, ASCAP, Memorial Foundation for Jewish Culture and others. He has written many works on commission from the Reading Music Society, Orchestra 2001, Galamp Corporation and others. Music of David Finko has been performed in Europe and in the USA as well as in South America, Israel and Russia. Finko’s Russian-Jewish heritage is an important aspect of his music, often providing the subject matter (especially for his operas and tone poems) as well as motivating the thematic content. Mussorgsky and Tchaikovsky, Shostakovich and Prokofiev, the music of the Russian Orthodox Church and Jewish folksong and synagogue music are clear influences on his style. David Finko has been especially interested in exploring tragic conceptions of the human life expressing those issues in his operas, concertos for instruments and chamber music. David Finko is featured in Grove’s, Baker’s and Baker’s Opera Dictionaries as well as in the US Navy magazine the “Undersea Warfare” ( Fall, 2002). 50:00 Fl. Cl. Ct. Tu. Perc. 2Vln. Vcl. Cb. Ob. Cl. B.Cl. Vln. Vcl. Cb. Perc. 14:00 Solo Picc. ; 0 2 2 0 – 2 0 0 0; 2Perc. Str. 22:00 Viola, Double Bass soli; 2(Picc.) 0 2 1(Cbsn.) – 2 1 1 0; 2Perc. Str. 24:00 Violin solo; 2(Picc.) 0 2 0 – 2 1 1 0; 2Perc. Str. 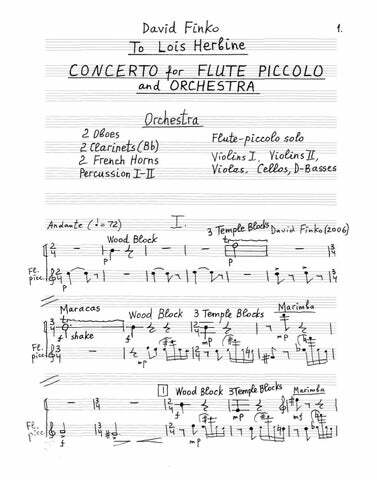 for Flute, Oboe, Bassoon, Percussion and Strings 20:00 Viola, Double Bass soli; 2(Picc.) 0 2 1(Cbsn.) – 2 1 1 0; 2Perc. Str. for English Horn, Bass Clarinet, Contrabassoon and Orchestra 17:00 E.H., B.Cl., Cbsn. Soli; 2 0 2 0 – 2 2 1 0; 3Perc. Str. 20:00 solo Piano; 2(Picc.) 0 2 1 – 2 2 2 0; 2Perc. Str. 6:26 3(Picc.) 2 3(B.Cl.) 3(Cbsn.) – 4 3 3 1; Timp. Perc. Str. …another of his powerful, evocative and soul-shattering compositions… the Slavic tradition of musical excellence. Perhaps we will be able to brag in the future that the famous (we hope) Russian composer had his American beginnings in El Paso. Mr.Finko pulled out most of the stops for his MOSES. It was serious. It was whimsical. It was fun. It wasn’t too long. 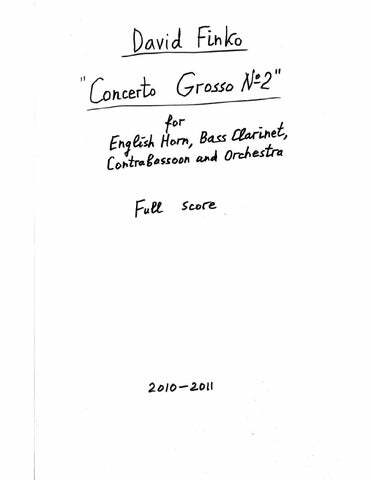 …one of the most important unveilings Orchestra 2001 has presented. His music exploits a rich, dense string sound in writing that drew strong colors from the solo instruments. We Philadelphians must rejoice at Mr.Finko’s residence among us, and his generous sharing of his genius with us…Mr.Finko played the Fantasia with his accustomed brio, and Shostakovich might have envied him this powerful music. …in the careful elucidation of themes and the textural contrasts of the instrumental scoring, Finko writes as cleanly as Hindemith in his American phase.